Each of our employees is well trained in his or her field. We pool that experience and draw from each others' strengths to provide you with comprehensive care and dentistry techniques. Dr. Woodruff grew up in a small town in central Missouri called Marshall. He graduated from Wheaton College with a B.S. in Biology, then went on to earn a degree as a Doctor of Dental Surgery (D.D.S.) from the UMKC School of Dentistry in 1992. He practiced for three years with another dentist in Wichita before taking over this existing practiceStarted by Dr. Ted Funke in the 1950's. The practice was later taken over by Dr. Larry Jones in 1986. We strive to maintain the high quality care that these two dentists began. We have many third generation patients, as a result, who benefit from the same commitment to care that their parents and grandparents enjoyed. in July of 1995. We moved to our current location in September of 2007. Dr. Woodruff enjoys educating people about their teeth. He maintains his license in Kansas. Dr. Woodruff is also a member of the Wichita District Dental Society, Kansas Dental Association and American Dental Association. Debbie has years of professional experience in handling insurance claims and filings. She began working for Dr. Woodruff in 1995. She enjoys making the front office run efficiently, helping patients with any questions they may have, and making sure proper insurance paperwork is filed for each patient. Away from the office, Debbie enjoys shopping, gardening, and spending time with her family. Vanessa Graduated from WSU in Dec. 2002 with Bachelors in Business then in May 2006 with a Dental Hygiene degree. She began working with Dr. Woodruff in May 2007 and has enjoyed meeting and caring for her patients. Away from the office, Vanessa enjoys spending time with her husband, children, and of course, her furry critters. Senna has been a dental assistant for over 10 years. She has traveled and lived in several cities around the United States. She is happy to be in the midwest enjoying the people she works with. Away from the office, Senna enjoys traveling, reading, and spending time with family. Lori graduated from Wichita State University with her Dental Hygiene degree.She has been a hygienist over 14 years. 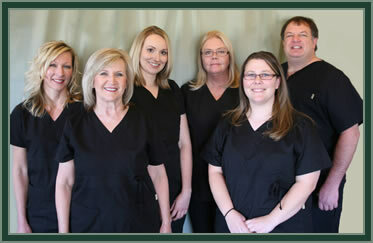 She likes to educate patients while helping to maintain their health through excellent dental care. Away from the office, Lori enjoys reading and watching her kids play baseball and softball. Jess has been a dental assistant for 13 years. She and her family (with three beautiful children) moved from Mountain Home, Idaho almost 8 years ago. She is passionate about the dental field, helping patients feel at ease in the chair and encouraging them to feel great about their smiles!